Celtic manager Brendan Rodgers has accepted that the Premiership champions could lose veteran midfielder Scott Brown to sunnier climes next year. The 33-year-old, one of the most successful captains in the club’s history, is set to become a free agent at the end of the current campaign and will be able to negotiate with suitors from January. It has been reported that Western Melbourne hope to persuade the former Scotland captain to end his playing career in Australia. Any offer would be conditional on the Victoria club being one of the two clubs admitted to the country’s A League when it expands from 10 to 12 members next year. On Thursday, the Western Melbourne Group discovered that they were one of six clubs under consideration by the ruling body for the two places and, as well as constructing a state-of-the-art 15,000-capacity stadium, the owners wish to build a team around Brown’s leadership qualities. The Scottish champions have been in talks with Brown over a new, one-year contract and he has also been promised a place on the coaching staff by Rodgers, but the Irishman accepts that the lure of sunshine and surf may be difficult to reject. “I’m not surprised there are people interested in Scott,” said Rodgers. “He’s shown incredible loyalty to Celtic but he’s had the football rewards from that as well. After 11 years, he’s been great for the club but he’s getting towards the cycle of life for a footballer where he may want to look at other things. 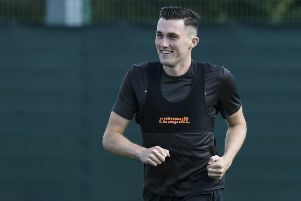 “Scott loves it at Celtic and but players can get offered a financial reward late in their career for two or three years and they may not get that again in their life. Rodgers will not attempt to rush Brown into a decision on his future, arguing that he deserves the time to fully examine all of his options. “One thing he has earned is time for what he has given the club over the duration of his time here,” he added. “It’s all speculation at the moment but I won’t be surprised if there are a few interested in him coming into his last year. “I know he is happy speaking with the club as well so, by the end of the season, we will know either way what is happening. “Will Scott only be truly appreciated when he’s no longer here? That will be the case, yes. But he is still very much here, that’s the thing; he is an incredible leader of the team on and off the pitch.